Teen Driver in Your House? Getting a driver’s license is a rite of passage of sorts. The first step toward adulthood, that small card signifies that you’re firmly on the path to independence. For a new driver, it’s freedom. For the parent of said driver, it’s at once liberating and terrifying. Back in the day, I took driver’s ed at my high school, after the regular school day, from a gray-haired retired teacher who would take us out in a car with a passenger-side brake (just in case) and a “Student Driver” sticker splashed across the rear bumper as a warning for the rest of the driving public. He’d regale us with tales of bad-drivers past who he’d eventually tutored to become (presumably) competent and licensed. We’d cruise my small Connecticut town, parallel parking, practicing three-point turns, and learning the basic rules of the road. A few lessons later, we’d schedule an appointment at the DMV, take a written test, and perform these same basic driving tasks with an official evaluator. Here we are, 25-plus years on, and I find myself with a 16 year old, and a whole new set of circumstances. In Arizona, potential drivers who are younger than 18 are required to pass an MVD-approved driver-education program. OR they can have a parent or guardian certify that the teen has completed 30 hours behind the wheel, including 10 at night. No matter if said hours were completed under the tutelage of a road-raging, blinker-eschewing, radio-blaring, bad-driving-habit-sharing, parent with little knowledge of either teaching or driving. Not that any of those descriptors apply to this auto writer, but I decided to go the professional route for my daughter’s instruction, starting with the Ford Driving Skills for Life class, a free full-day program that takes young drivers through several driving scenarios, in a controlled environment. Stations include emergency braking, distracted driving, impaired driving, hazard recognition, and some time learning about vehicle control behind the wheel of a Mustang with a professional driver. 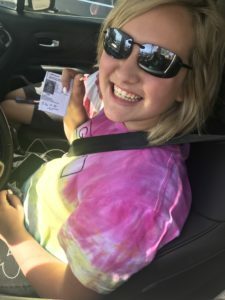 The level of experience for students ranged from beginner (at this point, my daughter had had her learner’s permit for an entire 10 days) to teens who had their licenses for a year or more – some of whom were repeat students in the program. One dad confided that he had signed his son up for the class after the teen was involved in a one-car accident a few months prior, and was now feeling a little nervous behind the wheel (as were his parents). The course itself builds confidence by putting young drivers in emergency scenarios with the comfort of a professional instructor talking them through it from the passenger seat. For the distracted driving portions, kids went through the course twice – first, with no distractions, and then while texting, Snapchatting, or Instagramming – in order to get an idea of how much more difficult it is to stay between the lines when their focus is on the phone and not the road. The impaired driving simulation involved wearing actual “beer goggles” and trying to drive a fairly simple course. Many a traffic cone was sacrificed during my foray through this one. The Mustang exercise helped with vehicle control during turns, but what my daughter really got out of it was that it was “fun to have the experience of joy riding in an expensive car under your belt.” But, importantly, all of the exercises were conducted with a professional driver or police officer providing valuable advice, tips, and feedback in real time, and in a relatable manner. Motor vehicle crashes are the leading cause of death for 15 to 18 year olds in the United States, with 2082 teen drivers involved in fatal crashes in 2016. Ford Driving Skills for Life is a valuable tool to address common driving scenarios, reinforce positive behaviors, give teens practical advice and experience behind the wheel, and hopefully make progress in changing that statistic. When I learned to drive, it was in a small town, on rural back roads, or in school parking lots. Honestly, I never had the occasion or necessity to drive on a freeway until I’d had my license for a year or more. Living in a more urban area, highway driving is everyday life, and many of the suburban roads surrounding my neighborhood more closely resemble the two-lane highways of my home state than the rural roads that I navigated daily. Both offer different challenges, but illustrate why professional driving instruction is so important. Partially due to increases in driver training and improvements in vehicle safety, there has been a 46 percent decline in teen driver fatalities between 2007 and 2016. But teens are still significantly overrepresented in fatal crashes. Programs like this one help mitigate the risk for teen drivers on the road. 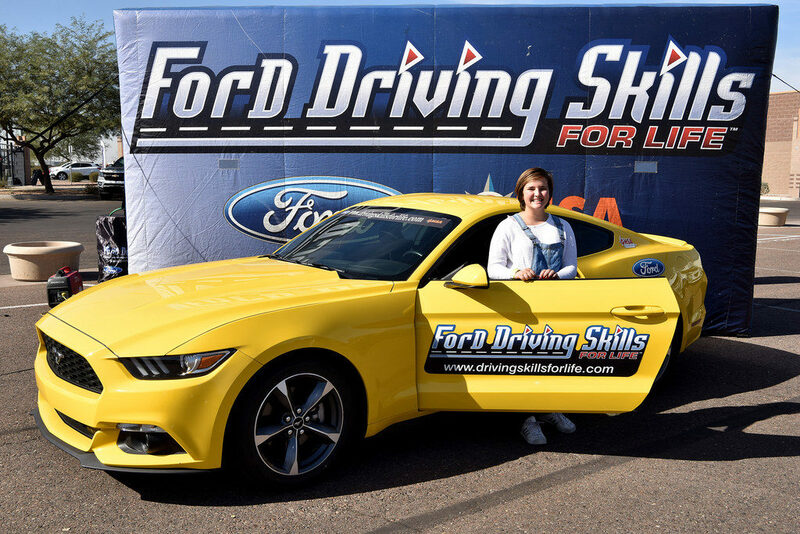 Ford Teen Driving Skills for Life will be in Arizona November 8-12 at the Phoenix Fire Training Facility. Check the website to register, for upcoming courses outside of Arizona, and for resources on safe driving.